Finally, you want to land as many Premier Balls you can. Legendaries and other high level Raid creatures attack very regularly, and since they are immune during these attacks, you can waste a lot of opportunities simply trying to land a single ball. While these attacks are random, there is a way to avoid them; by observing these attacks, and throwing the ball before the animation ends, the ball will land in the vulnerable window between attacks. If you didn't get to catch a Shiny Meltan when it first appeared in Pokemon Go back in February, you'll soon have another chance to add the special Pokemon to your collection. Niantic is holding an encore Meltan event beginning today, April 24, which means players around the world will have another opportunity to capture the Shiny form of the Mythical Hex Nut Pokemon. But you'll need to act quickly, as the event will only be around for a limited time. Unlike other Pokemon, Meltan will only appear in Pokemon Go if you've opened the Mystery Box, an item you get in the mobile game after you've transferred a Gen 1 Pokemon to Let's Go Pikachu or Eevee on Nintendo Switch. Typically, the Mystery Box will close after 30 minutes, and you'll need to wait seven days before opening it again; during the Meltan event, however, you'll be able to re-open it after three days, allowing you to find Meltan much quicker than usual. You'll also have a chance of encountering a Shiny Meltan each time you open the Mystery Box. You can tell the Shiny variant apart by its darker head and blue tail. If you manage to catch a Shiny Meltan and evolve it into Melmetal, it'll retain its Shiny coloration. However, you'll only be able to find Shiny Meltan until May 5, so you'll want to act fast if you're hoping to get one. You can read more on how to catch the Mythical Pokemon in our guide. Meltan isn't the only Shiny Pokemon appearing in Pokemon Go soon. To celebrate the inaugural Safari Zone event in Singapore, the rare Gen 2 Pokemon Shuckle will be appearing around the world from April 20-21. During that time, players will also have their first chance to find Shiny Shuckle. Shiny Latios is also available as part of a special Raid event, which is set to end on April 22. Not long after the Meltan event ends, Niantic will be holding Pokemon Go's next Community Day. That event is scheduled to take place on Sunday, May 19, and this time around the featured Pokemon will be Torchic, one of the three starters from Pokemon Ruby and Sapphire. You'll also be able to earn triple the usual amount of Stardust for every Pokemon you catch during May's Community Day. There are only a few hours remaining in Pokemon Go's Eggstravaganza event, which means time is running out to catch a Shiny Buneary. The event is scheduled to end at 1 PM PT / 4 PM ET today, April 23, making this your last opportunity to find the Shiny Pokemon in the wild and hatch more baby Pokemon from Eggs. However, Buneary isn't the only Shiny appearing this week; Shiny Meltan is also set to return for a limited time beginning April 24. The original story follows. A new in-game event is underway in Pokemon Go. With Easter just around the corner, Niantic has brought back the game's annual Eggstravaganza for another year until April 23, giving players around the world a chance to hatch more baby Pokemon, complete Egg-themed Field Research, and even catch an adorable new Shiny. ​In addition to those bonuses, you'll be able to get special Field Research tasks revolving around Eggs from Poke Stops. The bunny Pokemon Buneary will also appear in the wild more frequently throughout the Eggstravaganza, and you'll have your first chance to come across its Shiny form. You can read more on the Pokemon Go website. 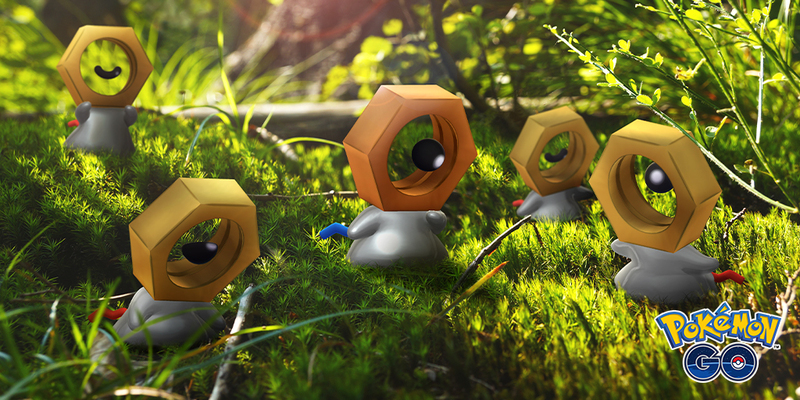 ​If you missed your first chance to catch Shiny Meltan, players will be able to catch the shiny form for a limited time starting April 24 - May 5. Meltan will only appear in Pokemon Go if you have opened the Mystery Box, an item that you get after transferring Gen 1 Pokemon to Let's Go Eevee or Pikachu. With this event, you'll be able to re-open the Mystery Box after three days instead of the usual seven, allowing for more chances to catch Meltan. Hello Trainers, today’s post is about a Pokémon with no less than 18 current formes. One for each Pokémon type, Arceus. Only the elusive Unown has more than this, topping the charts at 26. This is not including shiny versions of course. What makes this Pokémon different, however, is that it is a Mythical, and therefore only likely to be released via a Story or an EX Raid. With 18 formes available we have to ask several questions as to how we would obtain each one. We know that the Pokédex has been overhauled to give us the breakdown of all these different versions, so they should be on the horizon. Why does Arceus have so many formes? These formes are based around a mechanic introduced in the main series. Each Pokémon type has a corresponding “Plate,” when held by a Pokémon, boosts a damaging move of that type by 10%… or when held by Arceus will turn it from its default NORMAL to the corresponding Type… and as a nice side effect becomes immune to that type’s damaging moves. In Generation 7 each Plate was replaced by a Z-Crystal to give the same effect. Example : Arceus + Grass Plate = GRASS-type Arceus, Immune to all GRASS attacks. What is Arceus and why does it have this unique setup? Well, Arceus is thought to have created the Sinnoh region and possibly the entire Pokémon world, the lake guardians Uxie, Azelf, and Mesprit; and the creation trio Dialga, Palkia, and Giratina. If you follow the lore beyond what’s learned in Generation 4, Arceus is also the origin of Mew, Humans, and everything between. 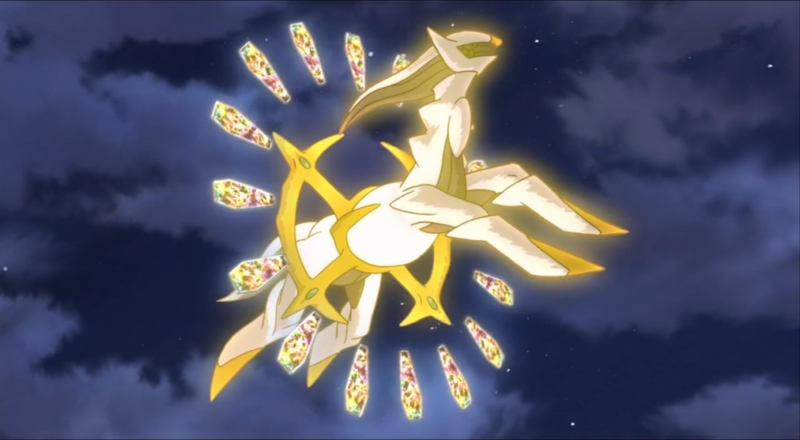 Arceus has 18 formes, all color variations on a theme. If Niantic were to follow the method of release like that of Deoxys, to change formes periodically, that would be 17 changes after the initial introduction. If we take two known time-frames, we can extrapolate how long each Arceus forme would be active… in theory. As Deoxys started in October 2018, we would end up with a cycle that would look something like the below. We could then trade for any versions we happen to be missing. Although, this does give us a much smaller window to obtain one of each compared to Deoxys. This writer, for example, only has 3x Deoxys at the time of writing. 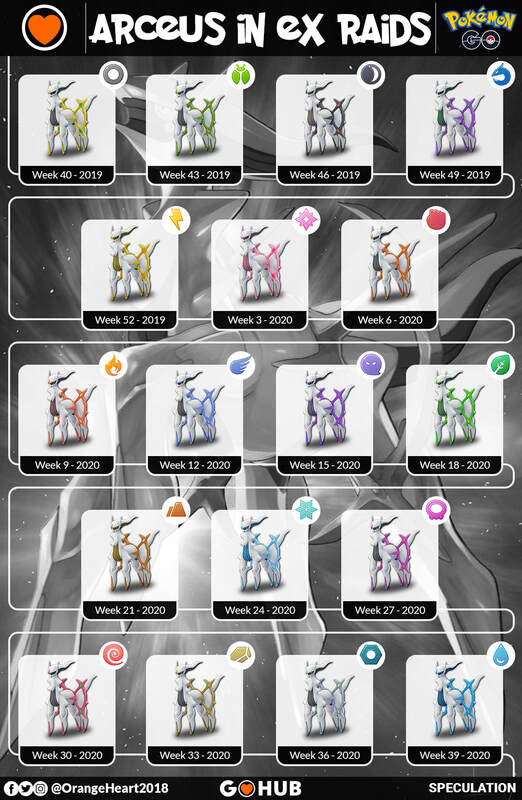 A 4-week phase, as an example, would be 72 weeks of Arceus… I think that might be a bit much. As Arceus is a Mythical Pokémon, it seems logical that a story mode would be introduced for us to obtain it. With the number of formes, it presents, there are a few questions as to how to gather all of them. Would the Arceus from the story mode be released with just a single forme or with a random forme as its final reward? If the reward was random would we be able to trade it for our missing formes? As I am sure many of you realize, Mew and Celebi cannot be traded. If the reward was singular would other versions be released over time via research, other stories, or raids? Item(s) to Change Arceus’ Forme? As we have detailed, to change in the main series you would use a special item to change Arceus’ forme. Could a consumable become available to change Arceus from one version to another? If introduced via a story mode, the parts leading to the encounter could reward such items. The downside of this would be item bloat for our bags and how to obtain more after the original story. Perhaps a single item to change to a random forme, rather than 18 different ones. Another possibility would be to spend candy on changing its forme randomly. Instead of the Evolution Button, we have a Forme Button. Rare Candy could then be converted to Arceus Candy and used to fuel the change. Assuming that story mode is off the table, or only viable for the first capture, could Arceus be added to the regular raiding distribution? Could NORMAL Arceus be added via story, but the other 17 be added to Tier 5 eggs as a month-long event? Would this lead to Arceus overload? If released via Tier 5 Eggs then Weather could determine which options are available to you… this would mean it was always Weather Boosted, which seems suitable given its role as the creator of the Pokémon Universe. As a more “out there” option, could Arceus be added as a Rare hatch from Tier 5 Eggs as a persistent, ongoing entry? For a suggested example, let us say a Regigigas event is live and featuring in Tier 5 Eggs, a small percentage of those eggs could be Arceus… let’s say 5-10% with a random forme. This would only be introduced after a suitable period after the Story mode had been completed. An even more “out there” option would be to add a new egg type; I’ll call it a Tier 6 Raid. Always in the game, always able to spawn, hatches Arceus…. maybe also a way to re-introduce Mewtwo and Deoxys to the game once retired from EX Pass. Could formes be added as a Breakthrough? It’s possible but would be a lackluster addition. Perhaps the previously mentioned consumable could be a Breakthrough Reward. We have many options, but with so many versions it’s hard to nail it down to just one. Of course, it is entirely possible that different formes will be given various methods to obtain if a consumable was not available. Weather, Time of Day, Season, Geo-location could all be used to trigger a change in its encountered forme. I look forward to reading your comments on this and see if anyone has come up with an alternative suggestion on how Arceus will bless us with its presence. Pokemon Go's April Community Day may have only recently ended, but Niantic is already looking ahead to next month's event. 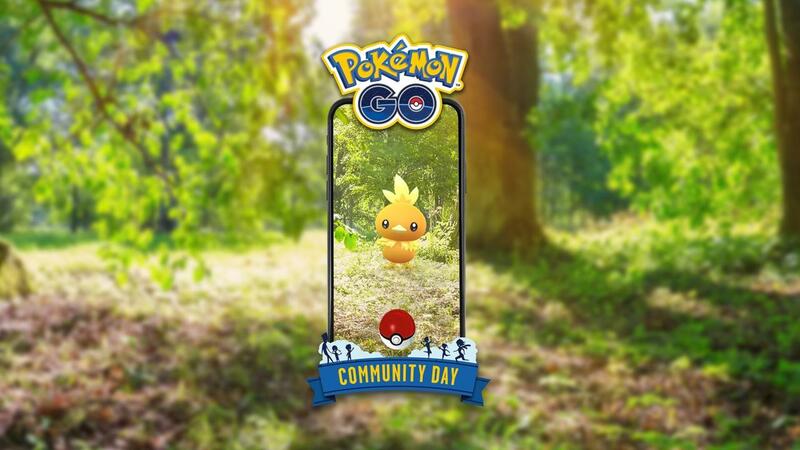 The developer has now shared the first details for May's Community Day, which is scheduled to take place around the globe on Sunday, May 19. As usual, next month's Community Day will run for three hours, from 3-6 PM local time. During that window, players will be able to earn triple the usual amount of Stardust for every Pokemon they catch, and any Lure Modules that are used will remain active for three hours. The featured Pokemon this time around will be another Gen 3 starter: Torchic. Throughout the Community Day, the Fire-type Pokemon will spawn in the wild more frequently than it normally does, making it much easier to add some to your collection. Going by previous Community Days, you'll likely also have your first chance to capture a Shiny Torchic. ​Finally, if you manage to fully evolve a Torchic into Blaziken up to an hour after the Community Day ends, it'll learn a special, as-yet-unannounced event-exclusive move. Niantic typically reveals what the special move is the week of the event. You can find more details about next month's Community Day on the official Pokemon website. 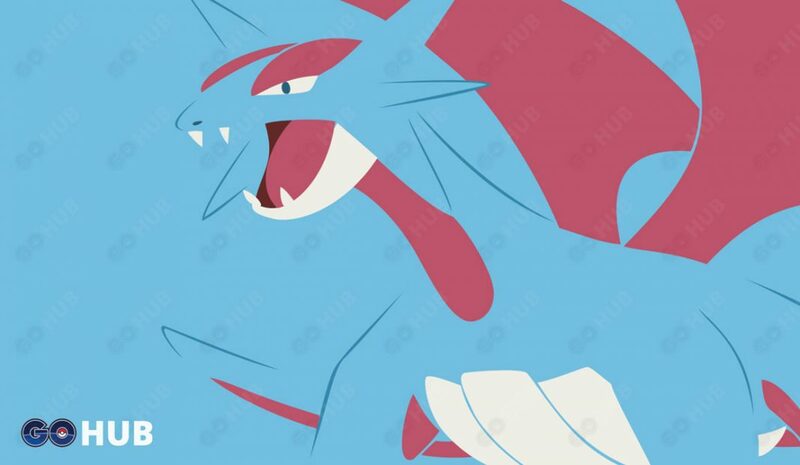 In the meantime, there are a few other big events going on now in Pokemon Go. First, the Legendary Eon Pokemon Latios returned for a special week-long Raid that's scheduled to end on April 22. 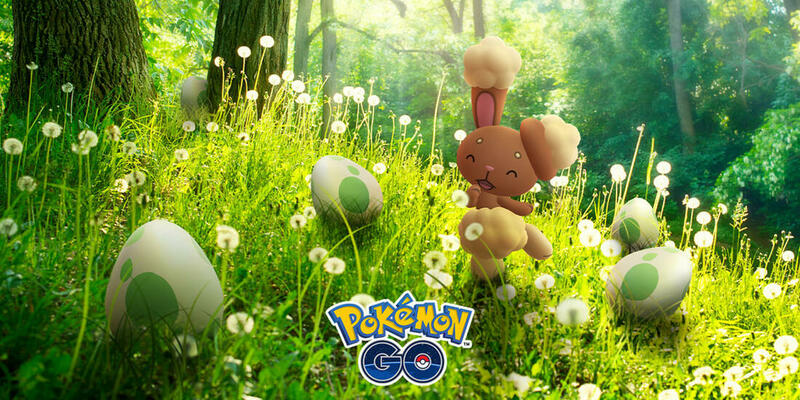 Niantic is also holding the annual Eggstravaganza event until April 23, which gives you more chances to hatch baby Pokemon and even capture a Shiny Buneary. At the feature's launch, there was an issue where some Lucky Friend trades don't result in Lucky Pokémon - this has now been fixed. 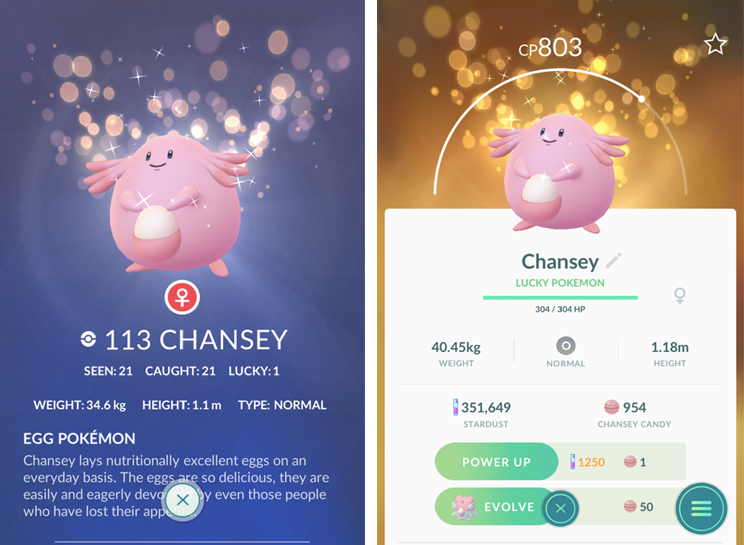 Additionally, the number of Lucky Pokémon you have caught will appear in the Pokédex (alongside 'seen' and 'caught') as well as the Pokémon stats screen, with a unique background.